Eskimo-3 Pure Omega 3 fish oil Omega 3 fatty acids DHA and EPA are known to be good for our health. DHA and EPA contributes to the maintenance of vision, normal brain function and contributes to a healthy heart. Eskimo-3 Omega 3 capsules also contain vitamin E an antioxidant that helps to slow down processes that damage cells. Purified to reduce environmental toxins. 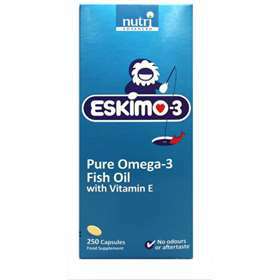 Eskimo-3 Omega 3 fish oil is also available in a omega fish oil liquid form. Consult a doctor if on Anti-Coagulent medication.